Applicants may apply for any class of membership for which they feel qualified. The Association reserves the right to assign alternate membership classes or reject any application. Institutional or associate members shall not represent more than one campus nor more than one academic division on campus. New members shall be furnished a membership certificate and such other properties of the Association as the Board may direct to be retained during membership. The annual dues for membership in the Association shall be established by the Board of Directors and approved by a majority of the institutional members at a general membership meeting. Members become delinquent in the Association if dues are not paid when due. Delinquent member status is removed by full payment of dues. The Board of Directors may, by a 2/3 majority, remove a member for non-payment of dues or actions judged as injurious to the Association. A removed member shall return all properties of the Association that were retained during membership. Any member of the Association may resign in good standing by giving written notice. Membership in the Association shall be of four types: Academic Institution, Industry, Organizations/Associations, and Individual. Organizations or individuals eligible for membership may fill out one of the following application forms. Please read the following membership grouping information, pick the hyper-linked type of membership that fits your organization and submit the completed form. Full Academic Institutional Members shall be those institutional academic units having at least one baccalaureate or higher degree construction or construction related program. Annual member dues are $750.00. Associate Members shall be institutional academic units of higher education, including junior and community colleges, not meeting institutional member requirements. Annual member dues are $350.00. Industry Members shall be corporate members demonstrating a constructive interest in construction education and/or research. Annual member dues are $750. Organization/Association Members shall be entities having a constructive interest in construction education and/or research. Annual member dues are $750. 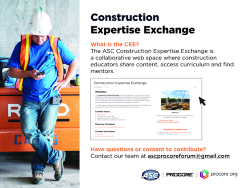 a.	Honorary Members shall be those persons who have been honored by the Association for the performance of distinguished service to construction education. Such honorary membership shall be conferred by the unanimous vote of the Board of the Association and shall entitle the recipient to the privileges of membership as a person, without payment of dues, but shall not entitle the honorary member to vote or hold office. b. Individuals who have an established history with active participation and/or service with the Association may request honorary membership when or if they are no longer connected to another form of membership. This request should be made in writing to the President and indicate previous connection with the Association along with the reason for the request. Such individual membership shall be conferred by the unanimous vote of the Board of the Association and shall entitle the recipient to the privileges of membership as a person, without payment of dues, but shall not entitle the honorary member to vote or hold office.